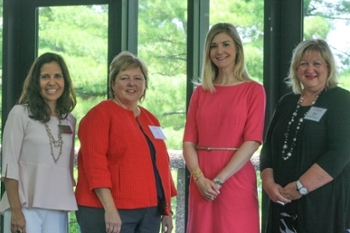 Take risks, be consistently you and provide mentorship were among ample advice presented at The “W” Network’s Metro East Women’s Leadership Summit held Wednesday, July 13 at Southern Illinois University Edwardsville’s Morris University Center. Approximately 50 women, including business owners and professionals, entrepreneurs and community leaders, attended the premiere event of The “W” Network of Downstate Illinois, an education and network-building organization where women leaders can engage and support each other. “This event provides an opportunity for female leaders to talk about challenges and opportunities in the business world, including what we’re doing right, what we can do better and how we can inspire each other,” said Silvia Torres Bowman, director of SIUE’s International Trade Center (ITC) and lead coordinator of the event. Torres Bowman noted that there are 9.9 million women-owned enterprises in the U.S. with an annual economic impact of more than three trillion dollars. These enterprises create or maintain more than 23 million jobs, or 16 percent of all U.S. employment. Denise Cobb, PhD, interim provost and vice chancellor for academic affairs at SIUE, welcomed the women to the University and emphasized the importance of diversity, inclusion and equity. The event’s featured presenters were prominent St. Louis area executives Danna N. Ellison, district vice president of Graybar, and Kay Guse, director of program management integration at The Boeing Company. 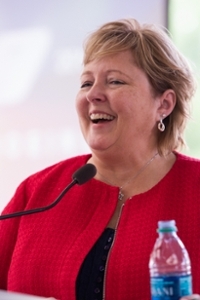 Ellison expanded on her career path, including a job change after years with the same company. 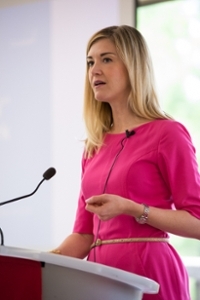 She discussed leadership style and the importance of holding consistently high standards for oneself and employees. Guse, an alumnus of the SIUE industrial engineering program and inductee into the SIUE Hall of Fame, shared the lessons individuals need to learn in order to achieve fulfillment and success. She emphasized the power of mentorship, of which she has 20-plus years of experience during her nearly 30 years at Boeing. “Quickly you learn that things happen through people, not through processes, documents or policies,” Guse explained. “Another lesson is to be careful of not using your network as a politicking mechanism. Be yourself. Be true to the people with whom you associate and keep those lines straight. The “W” Network of Downstate Illinois was spearheaded by Torres Bowman and Sherry Brianza, president/founder of Brianza Sales & Marketing Inc. and Brianza Bella LLC. The SIUE Meridian Society funded the event through a $1,000 grant for outstanding community outreach. The International Trade Center at SIUE serves businesses in Southern Illinois by providing individualized, export consultation to Illinois businesses; identification of foreign buyers, agents and/or distributors through trade leads; international market analysis and more. The ITC strives to support the goals and objectives of both the SIUE School of Business and the University at large. It is a service to the community supported by the U.S. Small Business Administration, Illinois Department of Commerce & Economic Opportunity and Southern Illinois University Edwardsville. To learn how these no-cost services can help your business, contact the ITC at (618) 650-3851, International-Trade-Center@siue.edu or www.siue.edu/business/itc. Photos: (L-R) Silvia Torres Bowman, director of the International Trade Center at SIUE, Kay Guse, director of program management integration at The Boeing Company, Danna N. Ellison, district vice president of Graybar and Sherry Brianza, president/founder of Brianza Sales & Marketing Inc. and Brianza Bella LLC. Danna N. Ellison, district vice president of Graybar. Kay Guse, director of program management integration at The Boeing Company.